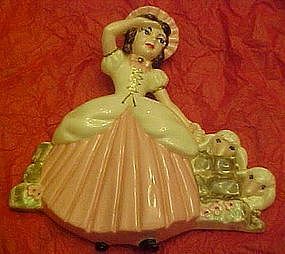 Hand painted glazed ceramic wall figurine marked Holland Mold. Little bo pep and her sheep. Measures 9 1/2" tall Would look great in a vintage nursery. Hang hole is molded into the back of her head for hanging. No chips, cracks or repairs. a few glaze skips on the back and edges.